A unique piece of Amelia Earhart story — one with a 60-foot wingspan — soon will have a home in Atchison, Kansas. 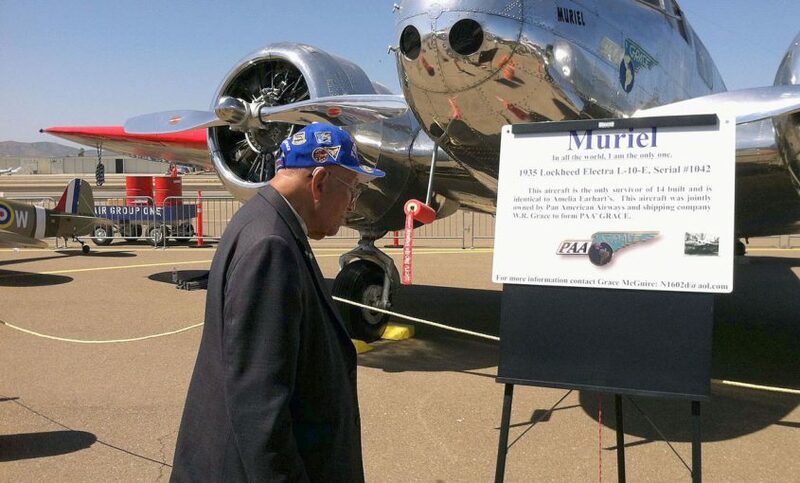 “Muriel,” an Electra Model 10E, will arrive in Atchison on Monday, Aug. 8, and plans are underway to house the plane in a new Amelia Earhart Museum, for which a fundraising effort is being prepared by the Atchison Amelia Earhart Foundation. In the 1930s, the Lockheed Corp. manufactured 14 Electra Model 10E airplanes, the same model flown by Earhart on her fateful journey. The last remaining of those 14 planes has been owned by a modern aviatrix named Grace McGuire, said Karen Seaberg, chair of the Amelia Earhart Festival Committee. The Atchison Amelia Earhart Foundation has arranged the purchase of the plane, affectionately named Muriel for Earhart’s sister, from McGuire, Seaberg said. A Facebook page titled “Muriel: 1935 Lockheed Electra L-10E Journeys to Amelia Earhart’s Birthplace” will chronicle the plane’s journey to Atchison, where it initially will roost at Amelia Earhart Memorial Airport. The organization also seeks to raise funds to produce and transport a statue of Earhart to the U.S. Capitol to stand with Dwight D. Eisenhower in National Statuary Hall, replacing John James Ingalls.